The 1310 Betty Dain Cool Vent Vest is made of Poly Nylon Blend material. Hair and water repellent. Stretch mesh back panel, two large front pockets with bottom zippers for easy hair removal, and snap front closure. Soft lightweight, cool and comfortable. 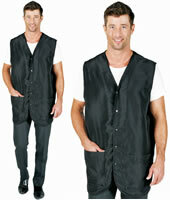 A breathable and professional looking vest.